It's April and time to talk about the CONFERENCE! Most have already registered and are getting travel details nailed down. If you're not registered (or you know someone who isn't), better hurry! The May 1 deadline is coming up quickly. This is the first of a series of emails that will help you prepare for our time together in North Carolina. Some of these emails will be practical and full of details. Others will be focused on helping you prepare your heart for this time of growth, inspiration, connection, and fun. Details about bringing guests, transportation, how to pack, etc. But before we dive into all that, we want to focus on the guiding theme for the conference. "Too Great To Count: The Movement of God Among the Nations" is rooted in the scene described in Revelations 7:9 with every nation, tribe, people, and language gathered to worship before the throne of God. The ultimate expression and realization of the Kingdom of God is when the redemptive reign and rule of Jesus happens in the lives of people …when the Kingdom breaks in and the highest and most excellent of the created order—human beings—become committed followers of the King of the Kingdom. While there are certainly other essential manifestations of the Kingdom, this remains the ultimate biblical centerpiece of the mission of God. A phrase that I like to use to describe this priority is that the Kingdom of God is never fully present unless people are becoming followers of the King. Over the past four decades, God has graciously entrusted to CRM – at different times, different places, and difference paces—the necessary components of these gospel movements. But in the past ten years, these components have all begun to come together into a rather extraordinary, unified mosaic. We’ve seen a remarkable and increasingly clear movement paradigm emerge that has become the guiding “North Star” in our philosophy of ministry. In the last year, along with our various leaders, I’ve sensed a shift from this very important “What we do” and “How we do it” to embracing more deeply “Why we do it.” I believe God is gently, but firmly, drawing us together toward the grand scope and magnitude of that calling. He is graciously wooing us with his cosmic vision that stretches beyond time and space. This captivating “why” is succinctly captured in the following phrase from Revelation 7:9. ...behold a great multitude that no one could count, from every nation, from all tribes and peoples and languages before the throne and before the Lamb. So when we gather for the World-Wide Conference in August, we believe that’s what God has set as our agenda. When God calls us to himself, and into intimate union and communion with every aspect of his triune nature, he also calls us to one of the deepest longings of his own character. He longs that we participate with him in his magnificent, far- reaching, redemptive purpose, to claim as his own”“…a great multitude that no one could count from all tribes and peoples and languages before the throne and before the Lamb” so that Jesus is worshiped and glorified forever and ever. The registration deadline is May 1. After that we release our reserved rooms back to the conference center. 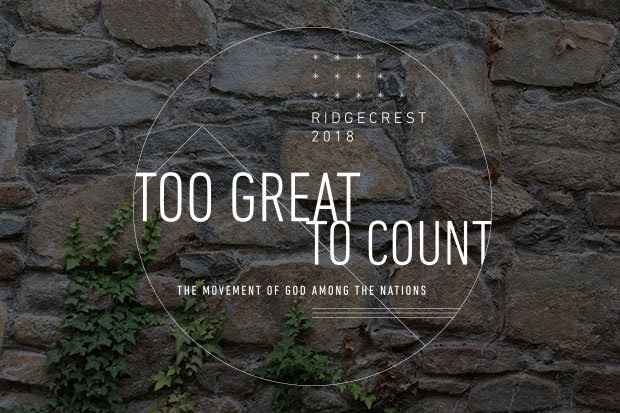 Register on the conference website at ridgecrest2018.crmleaders.org/pricing. The answers to all your conference travel questions are available on the "Updates" blog on the conference website.